MFC tool onscreen. Image Credit: Bureau Veritas. 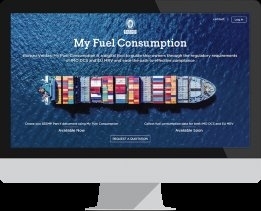 Class society Bureau Veritas has released the second part of its online tool for monitoring a ship's fuel consumption. Called My Fuel Consumption (MFC), the second phase of the cloud-based software enables fuel consumption to be reported for International Maritime Organisation's (IMO) data collection system (DCS) and European Union's monitoring, reporting and verification (MRV) purposes. "Using smart calculation engines, MFC ensures that vessel fuel consumption data is automatically registered for the different schemes," Bureau Veritas said. "IMO-DCS reports are submitted to Bureau Veritas for review and to provide a statement of compliance. EU-MRV reports can be generated by MFC and then sent directly to the EU's Thetis database by the owner or manager," it said. "Phase 2 of MFC continues to deliver a client's compliance requirements with simplicity and ease," said vice president for operational excellence Laurent Hentges. "It will provide accessible, accurate and useful data for our clients' operational management." The tool will accrue additional functionality in the future, he added. Users of Bureau Veritas services will find MFC on its client portal, Veristar.